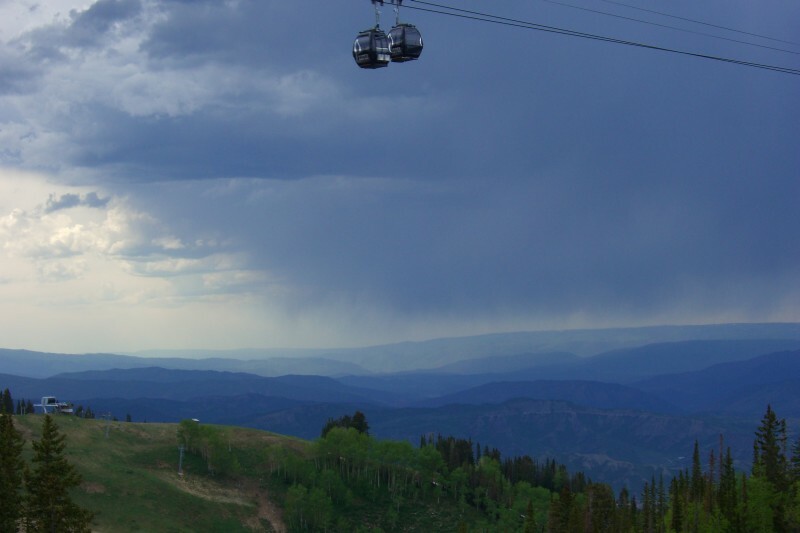 Two gondola cars pass each other above Aspen Mtn ski area, amidst stormy skies. Hiked Ajax just over a week after skiing there, for the late-season reopening during the Food & Wine Classic. Here, two gondolas cars pass each other, suspended high above Aspen Mountain. The stormy skies provide great shadowing and depth for the mountains and foothills down the valley. This entry was posted on Friday, November 21st, 2008 at 11:59 pm	and is filed under storms and tagged with Ajax, mountains, spring, storms. You can follow any responses to this entry through the RSS 2.0 feed. You can leave a response, or trackback from your own site.